The Community Connector Award recognizes an individual or pair of individuals who have dedicated their time and efforts to give all Ohioans the opportunity to achieve their fullest health potential. Congratulations to our 2017 Community Connector Award winners Mike Espel of St. Vincent de Paul Charitable Pharmacy, and Cheryl Wheeler and Cheryl Jones of Goodwill Easter Seals Miami Valley. They were honored at the Community Connections Luncheon on Wednesday, May 10, 2017, in Columbus, Ohio. The Community Connectors received an individual recognition plaque and designated an operating support grant of $2,500 to the nonprofit organization of their choice. Mike Espel has been connecting the under-served of Cincinnati to the pharmacy services they need to meet their health goals for over 40 years. As a former pharmacist for the Cincinnati Health Department, Mike was selected to become the founding pharmacy director of St. Vincent de Paul Charitable Pharmacy in 2006. In this role, Mike opened a second location to increase medication access to neighboring communities. Mike recently opened his first satellite pharmacy inside a St. Vincent de Paul thrift store to reach even more people who struggle with limited means of travel. He also developed a program serving undocumented immigrants living in Cincinnati. From procuring donated medications and grant funding to managing staff and volunteers, Mike dedicates himself to ensure the pharmacy operations run smoothly. He invests time motivating patients to achieve their health goals and truly believes anyone can make a change to better themselves. Cheryl Wheeler and Cheryl Jones collectively boast almost 60 years of dedicated service to Goodwill Easter Seals Miami Valley. Wheeler works as director of Children and Senior Services and Jones is the senior manager of Youth and Senior Services. Wheeler is a former consultant and coach for the National Easter Seals Senior and Adult Day Services Network, as well as a member of the National Easter Seals Outcomes Task Force. She is a trainer for Centers Serving Intellectually and Developmentally Disabled and Older Adults as well as for Matter of Balance, an evidence-based program on falls prevention. Wheeler is past president of the Ohio Association of Adult Day Services and is a current member of the American Society on Aging, the National Council on Aging, and the National Adult Day Services Association. She also serves on the Alzheimer’s Association Miami Valley Chapter Board of Directors. Jones is the former manager of Outreach Services with the Community Action Agency in Cincinnati. She volunteered with the Head Start Program, assisting grandparents who were raising their grandchildren. At Lutheran Social Services, she worked with single parents and grandparents and children to facilitate and provide oversight for family advocacy, education, and community engagement. Jones works with the Miami Valley chapter of the Alzheimer’s Association and will be a panelist for its 2017 Dimensions of Dementia. Congratulations to our 2018 Community Connector Award winners Kimberly Baker and Alisha Harper of Area Agency on Aging 3. They have worked tirelessly to connect Ohioans to community resources. In their current roles at the Area Agency on Aging 3, they have been instrumental in developing support programs and raising awareness of elder abuse. In the past three years, they have served more than 448 older adults and disabled victims within their seven-county service area. As part of their work, Baker and Harper have developed strong working relationships with Adult Protective Services, law enforcement, county prosecutors, victim advocates, local hotel and apartment managers for emergency housing, home health providers and domestic violence shelters. These relationships have helped local community resources come together to assist victims of elder abuse. Baker is a licensed professional clinical counselor, supervisor designation, with a Master’s degree in personnel counseling and the most advanced, independent license in the counseling field in Ohio. Harper is currently the lead behavioral health care coordinator for Area Agency on Aging 3 Awakenings and Stages Program. She has over 30 years’ experience in counseling with a special interest in working with elders, crisis situations, and grief. Harper has over 10 years’ experience working with elders at the Area Agency on Aging. Harper is currently a care coordinator for the Awakenings Program and counselor for the Stages Program. Prior to working with Area Agency on Aging 3, she was actively involved with the local Crime Victims Services program as an advocate. Harper is also a member of the National Association of Social Workers. CINCINNATI (October 7, 2014) – The HealthPath Foundation of Ohio (HPF-Ohio) awarded its 2014 Community Connector Award to Kathy King, Guardian ad Litem and Court Appointed Special Advocate (CASA) Manager for ProKids in Cincinnati. The award was presented at the Foundation’s annual Community Connections Luncheon on October 3. King has served children in the Hamilton County Courts since 1999 and works tirelessly through committees, trainings, and presentations to make a difference. She is on the steering committees of the Hamilton County Family Violence Prevention Project, where she serves as chair of the Children Exposed to Intimate Partner Violence Committee, and the Hamilton County Domestic Violence Coordinating Council. She researched, developed, and continues to direct the Steps to Peace Program for ProKids which trains CASAs on recognizing the signs of witnessing domestic violence in children and addressing the issues that arise. King’s honor includes designating a grant of $2,500 to a nonprofit of her choice. The nonprofit must work in one of HealthPath’s focus areas and predominantly serve at least one of HealthPath’s 36 counties. King selected ProKids as the recipient of this grant. (CINCINNATI, February 16, 2017) — The Community Connector Award recognizes an individual or pair of individuals who have dedicated their time and efforts to give all Ohioans the opportunity to achieve their fullest health potential. 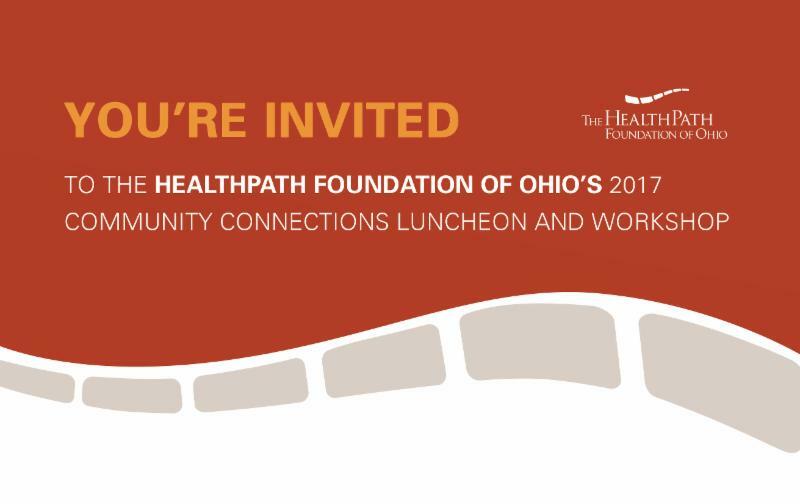 In 2012, The HealthPath Foundation of Ohio launched our Community Connections initiative to engage more organizations and people within our service area through grants, community programs, and volunteer opportunities. In this spirit of connecting communities to the resources they need to be healthier, HealthPath has created the Community Connector Award. Demonstrate significant service to HealthPath’s 36-county area and result areas of Cavity-Free Kids, Healthy Ohioans, or Safe Elders. If a team of two, work regularly together toward the same goal. Show long-term commitment to connecting Ohioans to the resources and opportunities they need to achieve their fullest health potential. HealthPath Board members, staff, grantees, and community members may nominate a person or team of up to two people for the Community Connector Award. Nominations will be accepted online. The deadline is Wednesday, April 5, 2017. HealthPath will create a selection panel to review the nominations and select the award winner. The winner will be notified on April 14, 2017. The Community Connectors will be honored at the Community Connections Luncheon on Wednesday, May 10, 2017, in Columbus, Ohio. The Community Connector(s) will receive an individual recognition plaque and will designate an operating support grant of $2,500 to the nonprofit organization of their choice. The nonprofit must work in one of HealthPath’s result areas and predominantly serve at least one of HealthPath’s 36 counties. For more information please contact Christine Mulvin at 513-768-6117 or mulvinc@gcfdn.org. You may also visit our website. grants to 18 organizations dedicated to improving community health in the Dayton and Cincinnati areas. life, independence, health, and safety. and inspire action around physical activity to enhance health, independence and well-being. through art exploration and art making. inclement weather, to enhance social relationships and overall physical and mental health. educate their students about how to keep their eyes healthy and safe for a lifetime. exercise, self-esteem and making positive choices. resources for mental illness and crisis intervention. to senior groups and engage community organizations serving their community. provide transportation and preventive oral healthcare at no cost to communities utilizing St.
Vincent de Paul pantry and Good Samaritan Free Health Center.